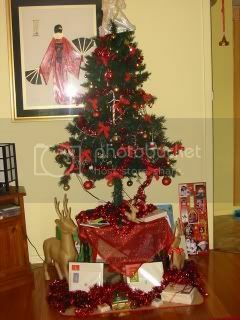 The Lounge - General Hencam Chat » Christmas 2011 - show us your tree! I really liked last year's thread where everyone posted pictures of their tree, so here is this year's! And the obligatory chicken decoration! I like that chicken!!! Just reprint my pic I sent last year - mine always looks the same! Mine looks about the same every year too, but as soon as I can find my camera I'll take another picture. I put mine up today and I hate it. it looks dull and miserable. I think I need to throw all my decorations away and buy some new ones! Aww I bet it's not Kate, maybe you just need some rat baubles or chicken decorations? I've got a ton of baubles, just got fed up putting them on the tree! I can never decide what 'theme' (for want of a better word) I want for it, so it looks really messy. Then I make the mistake of going to the local garden centre to see what they're like there and come away feeling very inferior!!! I get really grumpy after being scratched over and over by the branches too, but at least it meant I tidied out the cupboard under the stairs to get at the tree. Maybe I should post a picture of my tidy(ier) cupboard! Tha's athought Kate and we can applaud your tidy cupboard. Here is this years effort. Not that good at taking pics but you get the idea. Is that a festive reindeer I see? Hi, I am new here. I just wanted to share with you the best X-mas decoration ever. A very special Nativity Set with Stew as the little Baby Jesus in the manger. She has a broken leg and is currently enjoying bed rest and pampering. Looks like she's going to have a much better Christmas than a lot of other fowl. That explains why she couldn't walk then! She looks very festive in her straw 'manger' in front of the tree. I hope she gets better soon and doesn't get too used to all the pampering and attention! Both of the light fixtures in the living room have stopped working - doesn't bode well in a 4 year old house does it! The only light we have is the TV and the christmas tree so I'm glad I put it up after all. Have 'borrowed' the lamp from the bedroom for a bit of added light. Their Christmas tree was beautiful but the star at the top had a photo on it of THE HEAD MISTRESS. CheshireChicken, that is fab (apart from poor Stew's broken leg of course!) - so cute! 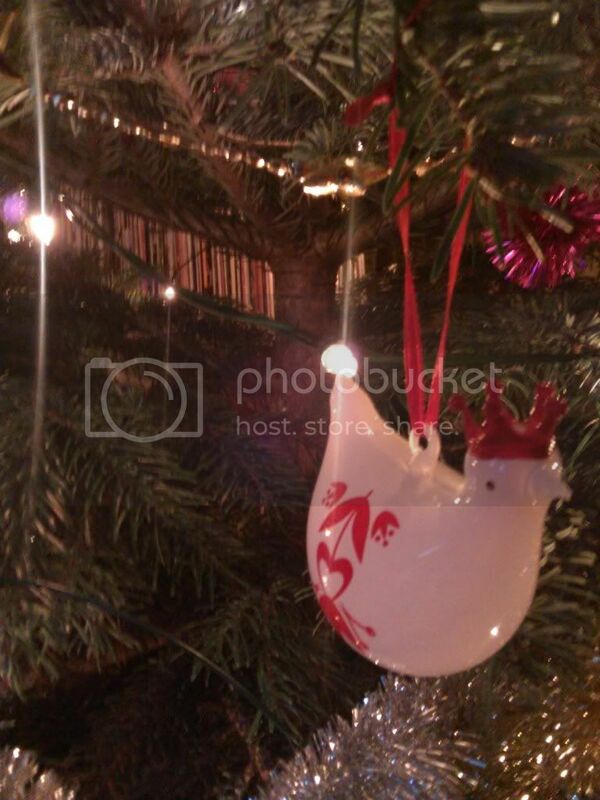 We have some glass chicken baubles but definitely as good as the real thing. Posted By: ollie in UK Looks like she's going to have a much better Christmas than a lot of other fowl. Kate, your house should be covered by the NHBC still at that age. Contact them! Or the builder in the first instance. Stew is lovely. And if you think she's going back outside in a cold henhouse when her leg's better...! Hi Cheshire chicken sorry to hear about your little hens leg. She looks so sweet there in front of the tree. That's a very novel fairy for the tree Neil! What are German stars NN? Look forward to seeing a picture of them and your tree. Here is our front room tree and Dodger decided he had to get in on the photo. Your Absolutely right CC he had already destroyed 3 by this time !!!!!!!!!!!!!!! Wow, Shaun has only managed to destroy 2 of mine! Dog beats baby again!!! Awww look at little Dodger, Bless him. You are right CC he has his eye on that Gold bauble for sure. So far this year my cats have been good and left every thing alone. I love the Mac'c tree topper and Helen's decoration are they Jessica Rabbit ? As most of you know I love Christmas and doing my decorations so do tend to go over the top a tiny bit !! They are similar to last years although I have redone most of it..... so here you go. First off my mantle piece and opposite wall. 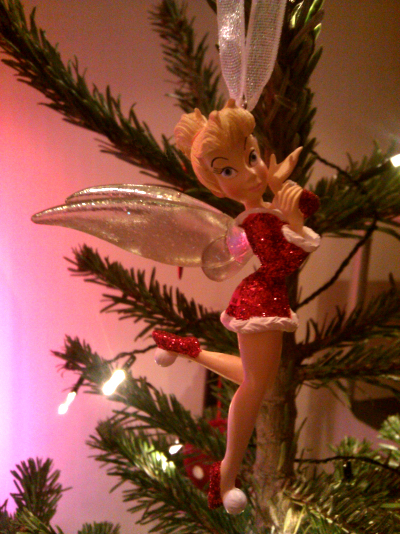 Here is my tree fairy she is sixty five now and very special. and finally the tree its self. Oh I meant to say thank you Ron for the lovely card, I really enjoyed seeing it. Your decorations are so pretty, NN..you always have the nicest looking trees. And I have tons of pics so shall start with the tree ones...! Lovely - everyone's so creative! Do you make new wreaths each year NN, or are they the same ones re-touched? They look fab, and Sootz obviously approves! Maybe Kasper just thinks a tree should be out there in the garden for him to pee up rather than in the house!!! 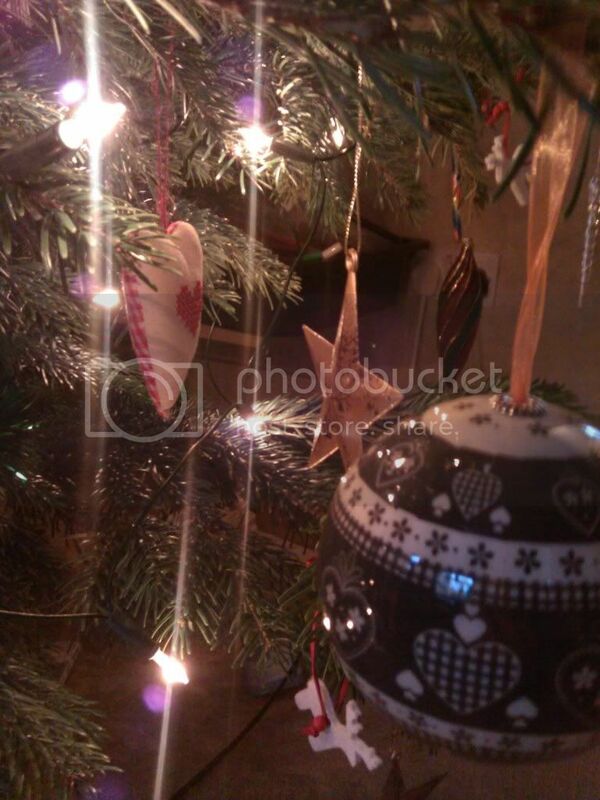 Lovely trees and decs and pics everyone. Stew get well and heal up soon she looks so cute in basket. He thinks he is a Goat Red. Great to have you back. Not trees....but on a Christmas theme.... I got my Christmas cakes finished today, the first one is for a gift and the second one is mine. Took ages making the penguins. I made a few spare then felt sorry for the ones that were left behind so added them all in the end !!!!! When you are little and Christmas is just soooo exciting that you could almost strangle Rudolf Then it all gets too much and you are just sooooo tired but dont want to nod off and miss anything. Thats when only a Nanny Chick Chick understands and makes you a special tent to have forty winks in. Your cakes are so lovely NN! How did you get her to have a nap?! We can't even get Caitlyn to sit down, never mind doze off - it's very rare nowadays. Wonder if a special tent would help her too? I love the names they have for us too - Nanny chick-chick is great! Caitlyn calls her other nan nanny Jess (after the dog). A friend last week made the mistake of saying to her "is this your grandma?" and pointing to me. She replied "no, grandma is grandad's mommy. This is nanny". NN, your cakes are sooooo pretty..and I love the tent you made! Wonderful pictures! I like living by your trees anyways. Poor little mite was totally worn out Kate, she had been at her Nanna Pat's for a week and couldn't settle down to sleep there,so didn't need a lot of encouragement, just the odd Christmas ornament for company and a little shack of her own !!!! Yes it is funny what they like to call you. Her Mum always wanted her to call me Nanny North and her Mum Nanna South, but she wasn't having any of that and came up with her own names. I introduced her to Peggy the other day and said this is Aurelia and she quickly said Yes and this is my Nanny Chick Chick !!!! SO Nanny North isn't really Nanny North sorry about that must be a bit like finding out there isn't really an Easter Bunny !!! Hee hee thank you Lee, I got time to play now I am retired so that helps a little bit. NN lovely cakes and cute pic of grand daughter too. Jonny where you been buddy? we haven't heard from you in ages!!!!! Good to hear from you. My tree is back in the cupboard under the stairs and living room back to normal. Feels so much better! Me too Kate, I suddenly feel all closed in and horrid if the tree is up for too long especially as we are having a heat wave here. I do love Christmas though. I don't take ours down until the very very very last second! I didn't enjoy Christmas at all this year, for the first time ever. Ruined by Borlase school & illness. But THIS year I'm going to go mad to make up for last year. So sorry that you didn't enjoy Christmas this year Kate and CC. I think this little tinkerbell made mine a more special than it usually is. She is looking as if she is on a cunning mission with those red eyes though !!! I love your little Tinkerbell, NN! She does look like she's up to something. She looks wonderful NN !!!!!!! !